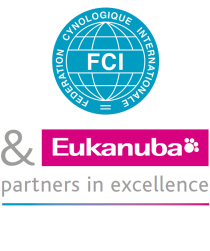 In the usual Caribbean heat, the Federación Cinológica de Cuba (FCC), a federated member of the FCI, held its Spring 2013 Expocanina InternaTional Show, judged by Mrs Ana Eugenia Vázquez (El Salvador), Mrs Natacha Díaz (Cuba), Mr Juan Alberto Grillo (Colombia) and Mr Ricardo Forasteri (Mexico). This four-day festival for Cuban dog breeders was held on the premises of the Gran Parque Metropolitano in Havana, which covers an area of more than 15,000 m². Two rings were set up in which exhibitors from Mexico and Spain joined us in a spirit of friendly rivalry, where every day was a show in its own right, with a full range of titles up for grabs. We had more than a hundred dogs competing in the ring at the Expocanina, with the most strongly represented breeds being Siberian Huskies, Cocker Spaniels, Shar Peis, Rottweilers, Shih Tzus, Dalmatians and Havanese. Each day the event began with a display of the Puppies, the champions of the future, with the Siberian Husky I Am The One Nariz de Nieve emerging as the best puppy in show. Once this part of the event was over, judging began for the categories involving the fifty breeds on show, the Groups, Best in Show and the Best Cuban Progeny. Sunday 28th saw the judging of the Exhibition Classes, with prizes being awarded for the Best Couple and the Best Progeny, along with the Expocanina Best In Show and the Best Cuban Progeny. In the end there always has to be a winner and, although competition was fierce, this time the Best In Show was the Briard Red Hot Chilli Peppers de Los Niegos and the Supreme Best Cuban Breed was the Basset Hound, Atila D´Matty, a worthy exponent of the work which Cuban breeders have been doing. The FCC Chairman, Miguel Calvo Cartaya, pointed out that our events are becoming ever better organised and that the quality of the dogs on show is constantly rising. One of the judges, Mrs Ana Eugenia Vázquez, agreed with him, and told everyone present how happy she was to see how the various breeds are improving from one show to the next, compared with the previous occasions on which she had sat as a judge. There can be no denying that Cuban dog breeding is making progress and this is why, at the next Meeting of the Americas and Caribbean section, we will be applying to host this major event in 2017, when we shall be celebrating the 30th anniversary of the Federación Cinológica de Cuba. It is important to highlight the fact that we are working towards gaining the patronage of the national breed “Bichón Habanero” (Havanese) - the only breed of Cuban origin - not only because of the way it is developing in our own country but also because it is setting standards for breeders worldwide. Now this year’s Expocanina is over, leaving us feeling tired but happy. It offers a chance to meet up with old and new friends, see some wonderful dogs, organise cross-breeding operations etc. As a result, we would like to take this opportunity to tell you about a few forthcoming events: the Exposición Nacional (National Show) on September 28th and 29th, the autumn Expocanina Internacional in November 2013, and the Campeonato de Campeones (Champion of Champions) in December 2013. All of this clearly proves that Cuba is a land of dog lovers.